The following list has been compiled by sorting through its performance for the past 5 years. Most of these emerging markets bond funds are also rated among the best in their class. Please check details about its management, performance, sales load, expense ratio, initial investment requirement, risk, top holdings, etc. The TCW Emerging Markets Income fund objective is to provide high total return from current income and capital growth. This bond fund utilizes its assets to buy debt securities issued or guaranteed by companies, financial institutions and government entities in emerging market countries. The fund may invest in non-investment grade bonds or junk bonds. This emerging markets bond mutual fund has total net assets of $3.05 billion. The 12-month dividend yield is 6.66%. The current fund manager is Javier D. Segovia. He started managing this fixed income fund since December 2009. The investors of this fund have received the dividend on January 2012 ($0.05). The minimum initial investment for brokerage account is $2.000. This fund has 1.15% annual expense ratio. The top holdings of this TCW fund are Petroleos de Venezuela (5.20%), IPIC GMTN Limited (3.04$), Bancomer (2.1%), Petrobras (2.03%) and Alfa Bank (2.07%). 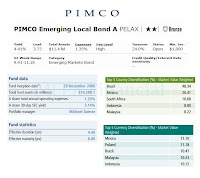 The investment objective of PIMCO Emerging Local Bond fund is to seek maximum total return, consistent with capital preservation and prudent investment management. This mutual fund invests majority of its assets (>80%) in fixed-income instruments denominated in currencies of countries with emerging securities markets. It may use forwards or derivatives such as options, futures contracts or swap agreements, and derivative instruments. Morningstar analysts have rated this fund with Silver rating. It also has a 2-stars rating for its past performance. This fund has a dividend yield of 4.41%. This emerging markets debt fund was first introduced to public in 2007. Michael Gomez is managing this top bond fund since 2006. It has total net assets of $11.44 billion. The fund has maximum sales charge of 3.75%. The 5-year annualized return is 9.74%. The effective duration of this fund is 4.46 years. The other classes of this bond include: Class C (PELCX), Class D (PLBDX), Class P (PELPX), Adm Class (PEBLX), and Institutional Class (PELBX). The top currency exposure is Mexico (12.07%), Poland (11.43%), Malaysia (11.00%), Brazil (10.98%) and South Africa (10.57%). The Fidelity New Markets Income fund invests most of assets in securities of issuers in emerging markets and other investments that are tied economically to emerging markets. It typically invests in debt securities of issuers in emerging markets. This best emerging markets bond fund may invests in other types of securities. This best bond fund has annual expense ratio of 0.88%. This is lower than the average in the Emerging Market Bond category (1.27%). The annual holdings turnover as of February 3, 2012 is 98.00%. This fund can be purchased from 69 brokerages. The 3-year annualized return of this fund is 20.16%. John H. Carlson is the current lead manager of this fund. He is the vice president and portfolio manager of Fidelity Investments. There is no management fee for investing in this fund. 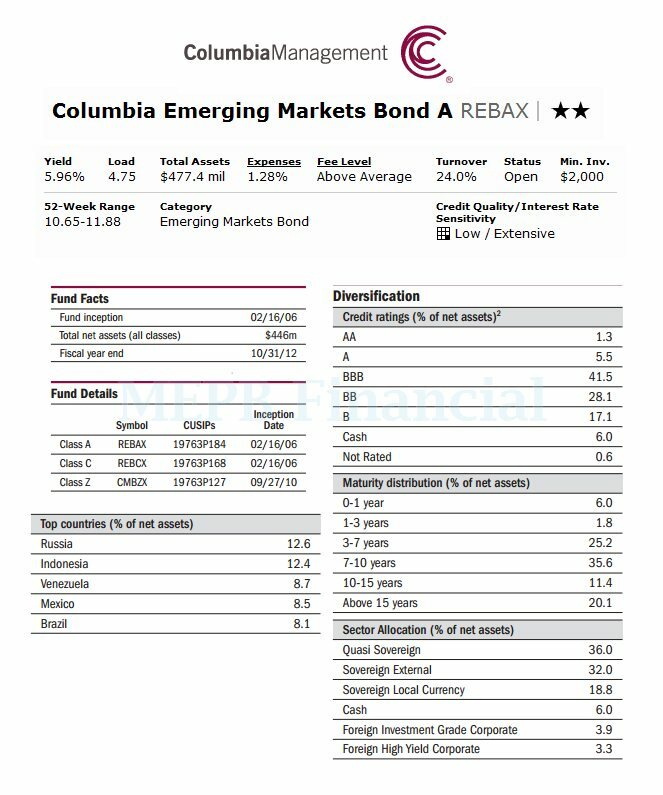 The investment aim of Columbia Emerging Markets Bond fund is to provide shareholders with high total return through current income and capital appreciation. 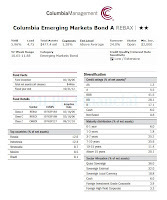 This Columbia fund invests mainly in fixed income securities of issuers that are located in emerging markets countries. It may invest in companies which earn 50% or more of their total revenues from goods or services produced in emerging markets countries or from sales made in emerging markets countries. It is considered as a non-diversified mutual fund. Morningstar has rated this mutual fund with 2-star rating for its performance. The YTD return of this bond fund is 3.38%. Since its inception, it has only 1 year of negative return. This was occurred in 2008 with -19.57%. 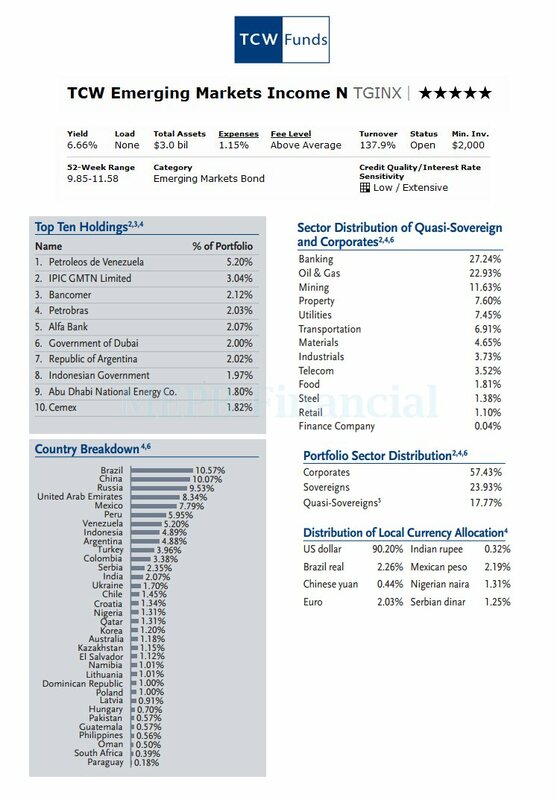 The top holdings of this fixed income mutual fund as of January 2012 are Republic of Uruguay Orient (3.61%), Petroleos De Venezuela (2.83%), Mexican Bonos (2.11%), Republic of Indonesia (1.81%) and Republic of Venezuela (1.74%). The Western Asset Emerging Markets Debt mutual fund uses its assets to purchase fixed-income securities issued by governments, government related entities and corporations located in emerging markets and related investments. It may invest <50% of assets in non-U.S. dollar denominated fixed-income securities. It may also invest in loans participation between governments and financial institutions. Matthew C. Duda has managed this emerging market debt mutual fund since 2006. This fund is part of Legg Mason/ Western fund family. It has 12-month dividend yield of 4.62%. The minimum initial investment needed for brokerage account is $1.000. The 12b1 fee is 0.25%. The average coupon of this top performer mutual fund is 6.58%. The effective duration is 6.94 years. The top sectors as of January 2012 are Emerging Market-IG (52.94%), Emerging Markets (39.69%), Cash & Other Securities (5.54%) and Investment Grade Corporate Bonds (1.83%). The Franklin Templeton Emerging Market Debt Opportunities investment fund invests >80% of net assets in debt securities of emerging market countries or developing countries. It may invest <100% of assets in debt securities that are rated below investment grade or junk bond. The fund may also invest small part of its assets (<15%) in defaulted debt securities. This best emerging markets bond mutual fund has returned 3.86% over the past 1-year and 21.77% over the past 3-year. The fund has achieved its best 1-year total return in 2009 (57.69%). The YTD return of this fund is 3.18%. The 12-month dividend yield of this fund is 5.94%. It has 5-stars rating from Morningstar. William Ledward has started managing this fund since its inception in 2006. The 3-year annualized return is 21.77%. This Federated Emerging Market Debt fund is rated with 2 stars rating by Morningstar. It currently has a yield of 4.98%. The total net assets are $213 million. The fund managers are Roberto Sanchez-Dahl and Paolo H. Valle. 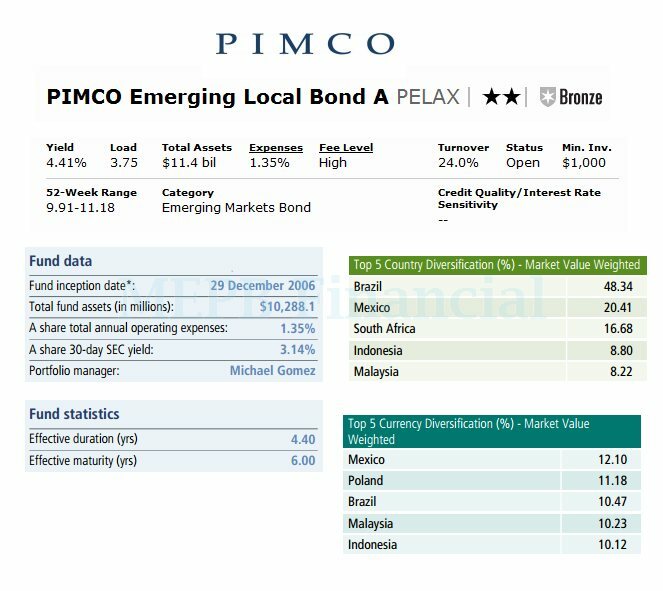 As of January 2012, the top 2 sectors of this emerging markets bond fund are government bond (49%), and corporate bond (38%). The average effective duration is 7.9 years. The MFS Emerging Markets Debt fund focuses its investment on debt issued by emerging market countries. This EM bond fund may invest in corporate debt issued by emerging market countries companies. The fund CUSIP is 55273E673. The expense ratio of this fund is 1.14%. You can invest in this bond fund with $1,000 minimum initial investment. The other classes of this fund are: Class A with load waived (MEDAX.lw), Class B (MEDBX), Class C (MEDCX), Class I (MEDIX), Class R1 (MEDDX), Class R2 (MEDEX), Class R3 (MEDFX), Class R4 (MEDGX), and Class W (MEDWX). As part of emerging markets bond fund, SEI Institutional International Trust Emerging Markets Debt fund seeks to provide maximum total return. It is rated with 4 stars rating by Morningstar. The dividend yield is 5.79%. This best bond mutual fund has returned 10.61% over the past 1 year, 21.53% over the past 3 years, 8.54% over the past 5 years, and 12.04% over the past decade. The worst 1 year total return was occurred in 1998 with -20.89%. This Goldman Sachs Emerging Market Debt fund has a yield 4.64%. It is open to new investors. The annual holding turnover rate is 116%. It also has a sales load of 4.5%. The expense ratio is 1.22%.